For this #FlashbackFriday I thought we might dive into some pretty cool snow images from the past. I have had these images saved for a while now because I really wanted to wait until we had some snowy weather to compare them to, and boy did mother nature deliver! Students are walking through about five inches of snow to get to their classes today after the snow filled few days we have had! Snow on campus is something that every group of students will experience while studying here at Iowa State University, and while some students love the snow, others are less than excited by it. From University Photographs box 328. Here are students walking from Curtiss Hall to Beardshear Hall on central campus in 1979. While there is no other date information for this photo, it looks like they were getting some pretty serious snowfall. This scene could have been recreated yesterday with the amount of snow students were walking through at the end of the day. This photo and more snow scenes can be found in box 328 of RS 4/8/J. Currently it is not snowing, but I can see my fellow students trying to navigate the frozen world outside. Here is a look at what the view from my window on the second floor of the library is right now! While most of the students are at their early morning classes, a few are walking the sidewalks, trying to get places with the two inches of snow we gained last night. Another cool photo that I found while looking through box 328 of collection RS 4/8/J – Snow Scenes, was an almost identical photo from the first group of students walking in the snow, only this one is from 1994! These students look a little more excited about the snow, and it looks like there was less snow compared to the photo from 1979. How cool is it though that we have two almost identical photos from two separate years? I love finding these connections in the archives, you truly never know what might turn up! From University Photographs, box 328. Hello everyone! We are very excited to introduce our new Curation Services Student Writer, Cassandra Anderson! Photograph courtesy of Cassandra Anderson. Cassandra grew up in Creston, Iowa where she spent a lot of her time in her mother’s elementary/middle school library. When she wasn’t there, she could be found hanging out in her grandmother’s libraries in Urbandale, Iowa. Cassandra is hoping to be the third generation of library workers in her family. She is currently a senior here at Iowa State where she is studying English. After she graduates she hopes to attend a graduate program to study library science or archives management. Growing up she occasionally was able to attend the annual American Library Association conferences with her mother and grandmother, and was even able to attend the most recent one in New Orleans this summer. While there, she sat in on a discussion lead by Librarian of Congress Carla Hayden and Archivist of the United States David Ferriero, and was incredibly excited to learn about her future career! Cassandra will be writing blog posts and sharing interesting finds on our social media accounts. When she is not writing for us, she is working as the student assistant on the AvIAn project here in the library. Welcome Cassandra, we are excited to have you! Today’s #TBT picture is of some young women, presumably members of Alpha Gamma Delta, performing in a variety show. From University Photographs (box 1669). Drop by and visit us and learn more about Iowa State’s history! This weeks #TBT photo comes from the College of Design. Pictured here is a group of students working on their projects for an art class. While the photo is undated, it looks like it was taken in the 1950s (note the hair and clothing styles, not to mention the saddle shoes!). For more information on the College of Design (which wasn’t a formal college until 1979), take a look at some of our collections! We also have many more photos of students in art classes, as well as photos of students’ art pieces. Students working on their art projects, undated. University Photographs, RS 26/2/F, Box 2076. Currently there is very little snow on the ground and it’s a windy but sunny 37 degrees Fahrenheit. However, today’s Throwback Thursday picture shows an entirely different scene. 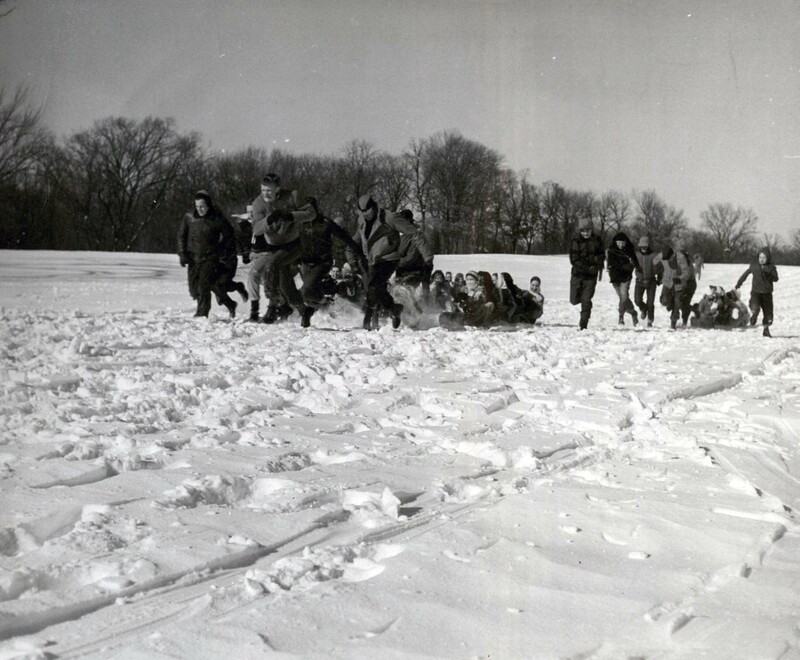 Below shows a snowy day, likely in late January, with students having a toboggan race during the 1949 Winter Carnival. Check out our previous post about the Winter Carnival. The reading room is closed tomorrow and Monday January 2. We are back to our regular hours Monday-Friday beginning Tuesday, January 3. Drop by and see us! Iowa State University has a ton of traditions. New traditions get developed and old ones fade away. Today’s post is about White Breakfasts, a now defunct tradition. 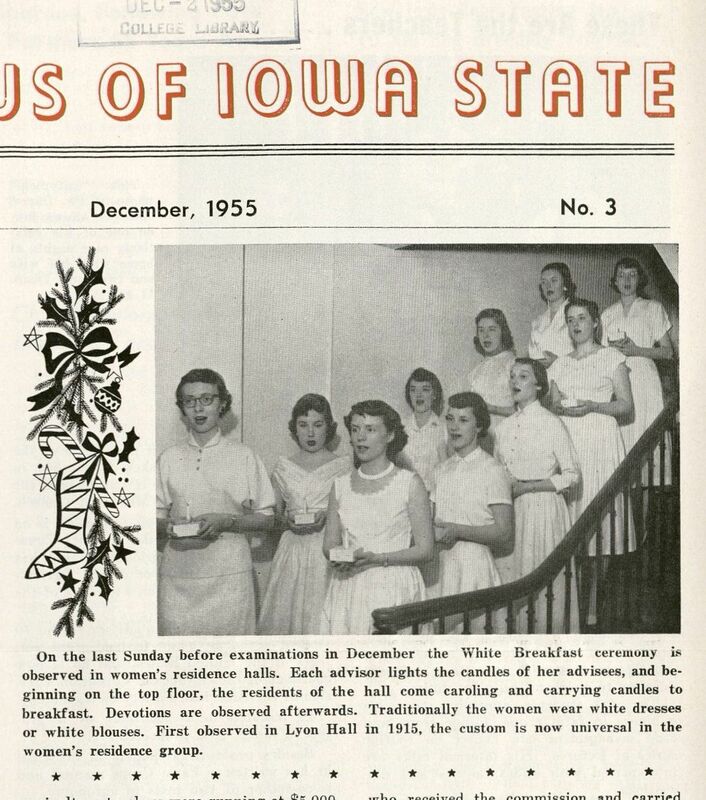 Please note, the caption for the image below states that the White Breakfast was first observed in Lyon Hall in 1915. Our Reference Specialist, Becky notes below that this ceremony was first observed in 1918. The 1918 observance is documented in Julian C. Schilletter‘s The First 100 Years of Residential Housing at Iowa State University. Dr. Schilletter held many positions at Iowa State and was the Director of Residence Halls from 1946-1967. From “News of Iowa” December 1955 issue (LH1. N39 Archives). White Breakfasts were observed in the women’s residence halls from 1918 through the early 1960s. Originated by a Lyon Hall housemother, they were held the last Sunday before the holiday break in December. The residents dressed in white and carried lighted candles. A caroling procession started on the top floor of each dormitory and proceeded to the dining rooms, where a special breakfast menu was served. On Monday and Wednesday afternoon this week, HIS 481X was busy in 405 Parks working on the layouts for their exhibit cases. Staff from the Conservation Lab created mounts and reproduced original materials, selected for the exhibit, so that students could play around with the layout design for the exhibit cases. The exhibit opens on January 18. Stay tuned for more updates! Drop by and see our current exhibits! We’re open Monday-Friday from 9-5. Check out the 1976 hairstyles. This was 40 years ago. I’m not sure it’s changed that much. The 1976 Look in Hair Styles: Anything Grows from pp. 80-81 in the 1976 Bomb. The Bomb is the ISU yearbook, in production from 1894-1994. Drop by our reading room and take a look at them. Or check them out online! Have you ever wondered what it takes to put together a pop-up exhibit? Last Friday, Special Collections & University Archives (SCUA) exhibited about two dozen items for three hours for Iowa State’s Homecoming. The temporary exhibit was open to the public, but our focus was alumni visiting for Homecoming. Today’s post is about our process. Back in mid-August, we invited the Alumni Center to drop by and see what items we thought we’d include in the October Homecoming exhibit. This dry run entailed staff from the department brainstorming on what items would be best to put on exhibit and what order they should be displayed. Labels were made and the classroom was rearranged into an exhibit space. Heather Botine, Associate Director for Constituent Engagement, dropped by and gave us feedback on how we set the room up and what kinds of materials may engage alumni more. We also discussed what reproductions SCUA could provide for digital display over at the Alumni Center. We made sure to promote our Homecoming event in the library and in our social media. We enlisted the help of Monica Gillen, the Communication Specialist for the library, and Jody Kalvik, Instruction, Program Coordinator. Monica helped get the word out and Jody designed flyers, posters, a banner, and our signage. We did one last practice run. We tweaked our list of items on display and took into account Heather’s set-up advice. We also invited Sonya Barron, Conservator, to drop by. Sonya ensured our items were sturdy enough to display, offered to provide mounts, and advised us how to safely display materials. We also made final decisions on what would be in the temporary exhibit and what order we wanted to display items, there was some rearrangement. Pictures were taken of materials so we’d know how to set up the following week. Now that we had our exhibit finalists, we had to finish drafting and mounting the labels. We spent the morning setting up and our doors opened at 1 pm. We were so pleased at the opportunity to show off our treasures. Thank you to everyone who visited us last Friday at 405 Parks Library. To those that missed seeing our treasures on display, drop by and see us sometime. We’re open from 9-5, Monday-Friday.